Little novelty helmets filled with soft serve? This isn't the 1980s. Peanuts and Cracker Jack? This isn't the 1890s. 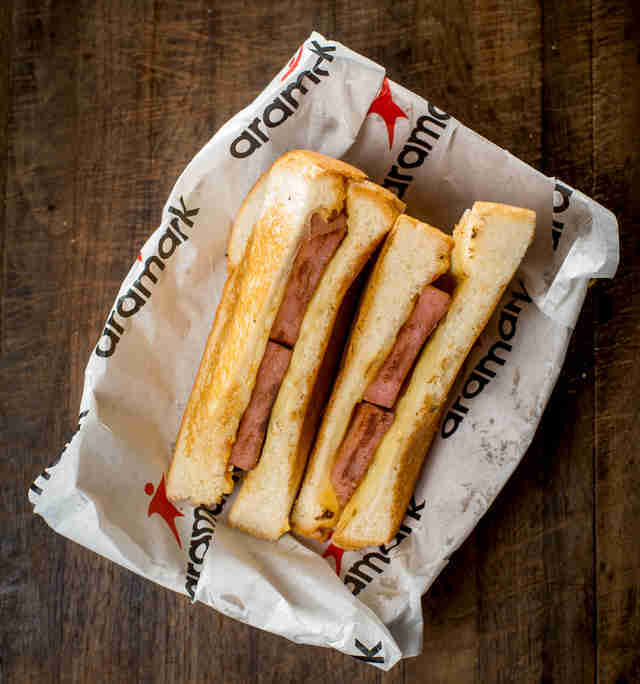 These days, vendors at Major League Baseball stadiums are engaged in an unofficial arms race to see who can craft the most outrageous stunt food. We're not complaining. What's more satisfying than watching athletically gifted humans run around in the hot sun as you kick back and eat massive chunks of cookie dough? The only answer to that question: reading about crazy baseball stadium foods appearing at a ballpark near you this season. The Mets continue their tradition of bringing NYC favorites to their ballpark in Queens with the addition of Cookie DŌ, an incredibly popular dessert shop serving scoops of (safe-to-eat) cookie dough. Like Shake Shack and Fuku before it, the Cookie DO stand will give fans a scaled-down version of the local favorite, with flavors like the classic chocolate chip, cake batter, and confetti on hand for sampling. The Mets may be the second-most popular ball club in New York, but their food is definitely better than what the Yankees have going on in the Bronx. And that's the most important part of baseball, right? Aside from the pitching and hitting and tobacco chewing, of course. Is a hot dog a sandwich? Is a taco a sandwich? These usually loaded questions become even more of a mindfuck with the advent of the Marlins' taco dog: a Nathan's frank, wrapped in a tortilla with chili, pepper Jack cheese, jalapeños, and sour cream. It's a dish fit for the absurdly flamboyant Marlins Park, and a worthy distraction from what is sure to be another brutal season by the floundering club. 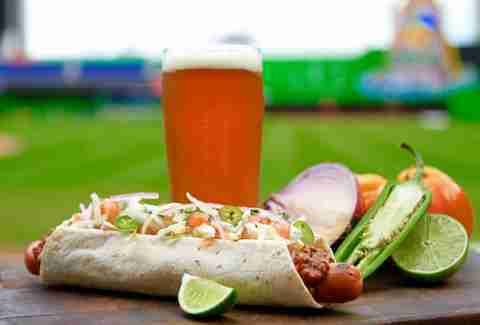 Are hot dogs better in a tortilla? Perhaps. But they are definitely not worse. Either way, this thing's probably not a sandwich. Riffing on poutine is a running theme in MLB parks this summer (more on that later), but obviously Canada's only ball club (RIP Expos) needed to throw its maple leaf-adorned caps into the fray. 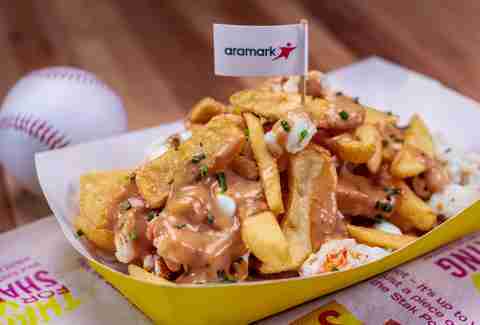 The Blue Jays are debuting a dessert poutine that swaps fries for churros, then ditches gravy and cheese curds for ice cream and caramel. Really, it's not poutine at all. 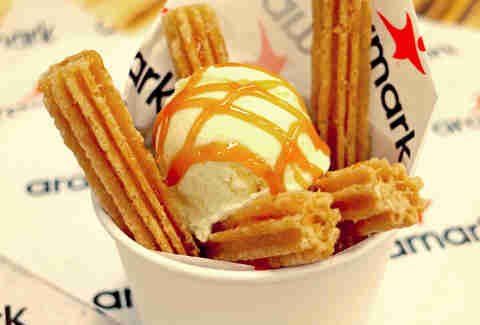 It's more like a sundae with churro sticks. But ultimately that doesn't roll off the tongue as well as "dessert poutine." Makes sense. Now Jays fans can indulge in this hedonistic dessert as they watch their team screw up in the playoffs. O Canada! 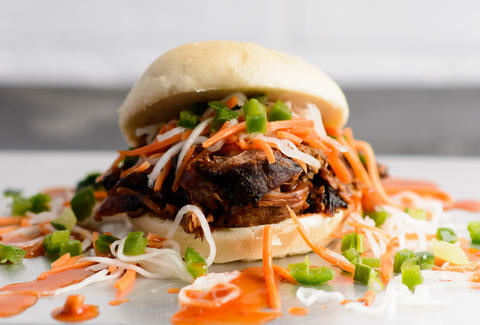 Not only are the Cubs reigning World Series champs, they also just swept the MLB Food Namies (which is an award I literally just made up) with the delightfully titled Bao to the Pork sandwich. 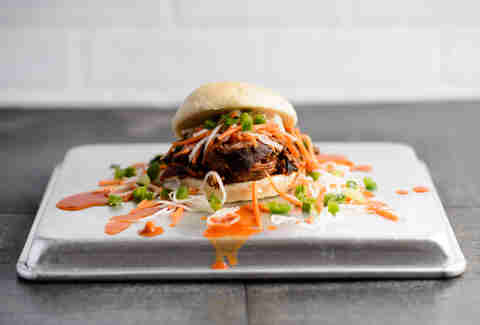 The sandwich -- from Chicago-favorite Pork & Mindy's -- combines hickory-smoked pulled pork with pickled daikon, carrots, and jalapeño relish on a steamed bao bun. 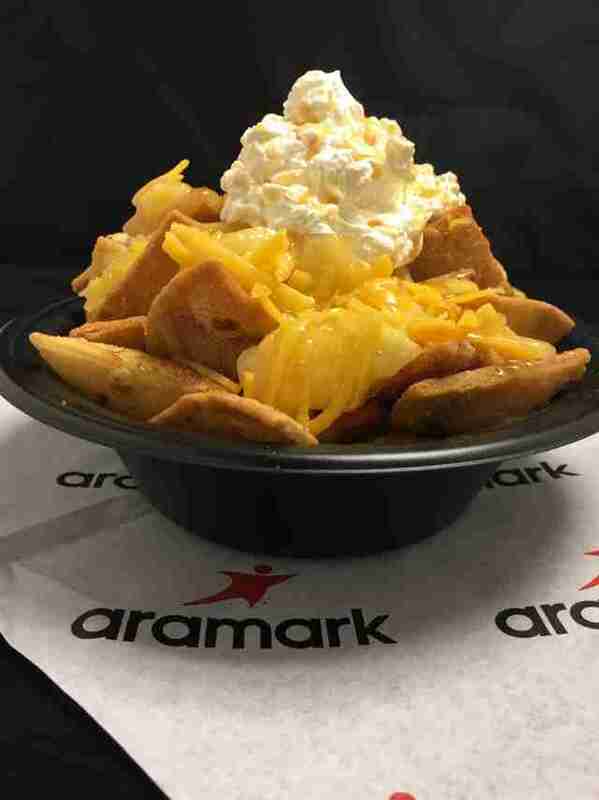 Now if the Cubbies faithful have to wait another century for their next World Series trip, they can do so knowing they have one of the most eclectic baseball snacks in the Big League. It's so good, it will make every North Sider forget how much they hate Steve Bartman, or that Moises Alou used to pee on his hands before every game. The bigwigs behind Chase Field -- home to the perennially mediocre Arizona Diamondbacks -- probably know they need a little oomph off the field to get their fans coming out 80 times a year. And with this new monstrosity -- a chicken patty covered in strawberry jam, maple syrup, and garlic black pepper Cheddar stuffed between two mini-funnel cake buns -- they definitely have our attention, if not our appetites. This could easily be one of those things that looks gross, but actually feels amazing... like eating a popsicle underwater in a hot tub. 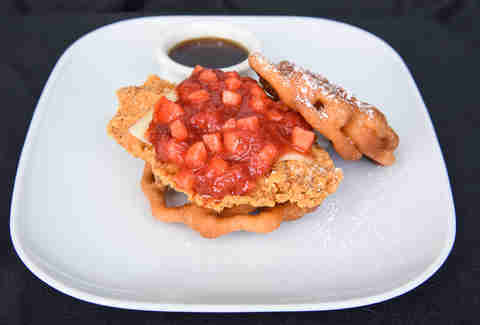 At any rate, you have to respect the D-Backs for bringing something new to the table… even if it will clog your arteries faster than the Texas State Fair. I know what you are thinking: A) "How can Jose Altuve be 3ft tall and still crush the ball?" and B) "Why would the Astros ruin a perfectly good grilled cheese with… SPAM?" A) It must be black magic. The spiced ham in the blue can gets a bad rap from pretty much everyone not living in Hawaii. But honestly, the addition of SPAM to a grilled cheese is basically the bacon grilled cheese redux. It gives your sandwich that super-savory, meaty kick that takes it from a simple GC to a bona fide meal. And on the plus side, when it's inside this gooey, cheesy sandwich, you don't really have to look at it while you eat it. Which is, of course, the grossest part of SPAM, and why the game "hide the SPAM" is so popular with teens. When you visit Fenway Pahk, you obviously want to get wicked toasted with some 'Gansetts before heading out to the Green Monstah and eating a Fenway Frank or two, right? Mostly right. Instead of the traditionally basic Fenway Frank, opt for this new creation, the lobster poutine: a hearty portion of lobster meat with cheese curds, French fries, lobster bisque, and chives. That's right, chives! Red Sox Nation may be baseball's current Evil Empire (sorry, Yanks), but their food is super-freakin' good enough to make them saints in our eyes. I've never stared into the face of pure evil. I have yet to look into the depths of my soul to confront my own mortality. 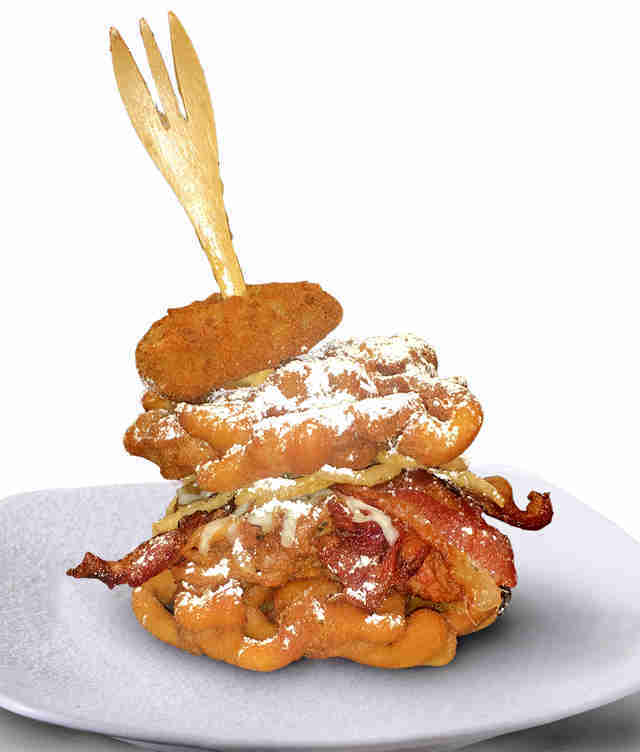 But I have seen photos of the Kansas City Royals' pulled pork patty melt, a skewered monstrosity featuring bacon, funnel cakes, fried chicken, jalapeño poppers, pulled pork, cheese, and fried onions. And frankly, that's close enough. Your cholesterol will spike just by looking at this sucker. It's like facing down your impending doom. Due to Colorado's high altitude, Coors Field is legendary for being a hitters park: a field where the balls fly higher than Maureen Dowd after visiting a dispensary. And now, it's also legendary for featuring the first melding of America's Favorite Dessert with Mexico's favorite bastardized stadium snack. Behold, apple pie nachos, a savory/sweet alchemy consisting of apple pie-stuffed cinnamon-sugar chips, Cheddar cheese, whipped cream, and a caramel drizzle. It almost makes you wonder if the concessions people were smoking some of Colorado's finest during this brainstorm. And, if Maureen Dowd was there, too. Detroit is a city that takes its coney dogs very seriously. It's also home to square deep-dish pizza and Little Caesars. So what happens when those three things come together? 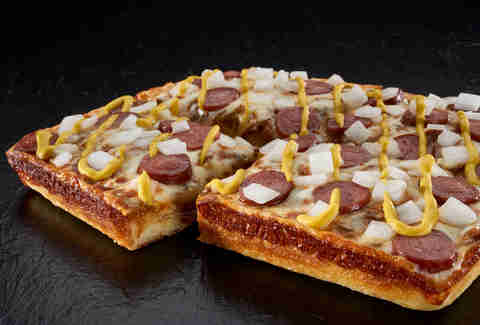 Behold, it's a deep-dish square pizza topped with hot dogs, mustard, and onions. Oh, and the sauce is replaced with the D's signature beanless chili. And with that, Detroit's Holy Trinity turned pure evil. Remember when Pizza Hut made hot dog-stuffed crust? Well, this is the moment in time when Little Caesars looked at that insanity, deemed it amateur hour, and threw down the gauntlet.